PARTISAN is an anti-fascist martial arts club located in the city of Barnaul in the Altai region of Western Siberia, not far from where the borders of Russia, Kazakhstan, China and Mongolia meet. Since 2017 PARTISAN has been providing training to both adults and children in three disciplines: mixed martial arts, Brazilian jiu-jitsu and ARB (Armeyskiy Rukopashniy Boy, literally “Army Hand-to-Hand Combat”). PATRISAN is not only a place where anti-fascists train, but also a regular gym with roots in the community. In this way it bridges the gap between militants and the broader working class, and plays an influential role in the lives of local youth. Recently we had the opportunity to talk to co-founder and head coach Matvey Korchagin about his own martial arts career, the movement in Russia, and the most efficient disciplines for street-level anti-fascism. GF: Please tell us a bit about yourself, and your own history with martial arts. MK: My name is Matevy, I’m 33 years-old, I work as a school teacher and as an instructor at PARTISAN. I started training martial arts at the age of eight or nine, initially in kyokushinkai karate. I started boxing in university, later taking up ARB and finally jiu-jitsu. I should mention that I earned my blackbelt not in Brazilian jiu-jitsu, but in so-called sport jiu-jitsu (RDF), which includes four types of competitions now: fighting system, ne-waza, duo system and kakuto. I don’t compete anymore, but I still train, especially in grappling and BJJ. GF: Can you clarify this difference between “sport jiu-jitsu” and BJJ in Russia? In Russia there are two jiu-jitsu bodies, one formal and one informal. First, there is the Russian Jiu-jitsu Federation (RDF) which is official, sanctioned by the government. This means that competitors who fight inside this organization not only earn belts like in BJJ, but they also earn degrees. Degrees are an important aspect of the sports system in Russia. Separately there is BJJ in Russia, which is not “official” although it’s very popular, especially in Moscow and Saint Petersburg. I like BJJ, that’s why we practice it at PARTISAN and take part in BJJ tournaments. GF: Is your gym exclusive to anti-fascists, or is it open to the wider community? MK: Originally the gym was exclusive to left-wing activists and sympathizers. But the goal was always to turn it into a “real” club with a broad membership, which is more useful for spreading our ideas. We succeeded when I started working in the education system and we got our own gym with the possibility to attract more students. It is usually youth who actively compete, while the adults who train at PARTISAN mostly aim at fitness and self-defence. We accept everyone except the far-right. MK: First of all, I would say that everyone makes his or her choice according to their priorities. If you are looking to improve your level of fitness or spend time in good company, so-called self-defence is fine. But if you need real skills and experience, you should choose something like boxing, kickboxing, Muay Thai, BJJ, etcetera. 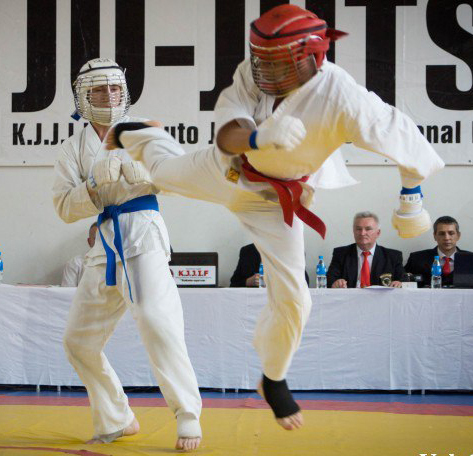 I think that the effectiveness of any martial art is defined by the inclusion of sparring and competitions, where the rules serve as the only limitation. Self-defence courses like Systema or Krav Maga have no sparring or competitions, so I think that people who train in them are delusional, and that self-defence instructors are con artists who teach their pupils things that won’t work in real life situations. GF: Speaking of Systema, this has become somewhat of a trend in Canada. What is your opinion of it? MK: You must run from Systema instructors as fast and far as you can! Those people are the object of constant jokes among the martial arts community in Russia. Systema is a business project of a fraud named Mikhail Ryabko who went to the West to make money, exploiting the lack of knowledge there. There are lots of similar types in Russia, “secret Spetsnaz instructors”, “followers of Cossack martial arts” and so on. Please, if you have friends who train “Systema,” educate them and tell them to train real martial arts. GF: One of the disciplines PARTISAN teaches is ARB, which is not well known in North America. Can you say something about this martial art and its strengths? MK: Army Hand-to-hand Combat or ARB is one of the most popular types of martial arts in Russia. Originally it was only open to members of the army and police before it got “civilianized,” although most trainers still have some military affiliation. ARB is similar to MMA, but combatants wear helmets with a protective metal grid, protective vests, gis and protection for shins, and if necessary, knees and elbows. According to the rules of competition, all striking techniques and all throws from judo, sambo and wrestling are permitted. Grappling and striking on the ground is also permitted, although choking techniques are forbidden. One special feature of ARB is that kicking a downed opponent is allowed. It makes ARB really effective (see video below). GF: For many of us in North America, our introduction to the anti-fascist martial arts movement came from Russia, particularly Ivan “Kostolom” Khutorskoy and the disturbing situation in the 2000s with violent hate crimes against foreigners. Can you tell us how the situation has changed since then? MK: Nowadays there is much less violence on the streets. There are many reasons for this, including a split in the far-right movement due to the Ukrainian crisis and harsh repressions against both right-wing and left-wing activists. Lots of people are imprisoned, or trying to lay low, or have left the country altogether. The intensity of violence also varies with location: the frontline has always been Moscow and Saint Petersburg, while other parts of country are much calmer. GF: What are the benefits and disadvantages to undertaking a project like PARTISAN somewhere like Western Siberia, as opposed to a big city like Moscow or Saint Petersburg? MK: In general the central problem is the same everywhere: limited resources. It’s typical of athletics in Russia that many parents simply cannot afford to enroll their kids in sports or martial arts. In the case of PARTISAN, our location has worked to our advantage, because the activist community here is really tight and there is little in-fighting. The situation is mostly positive: there are lots of competitions, kids fight here and improve, there is a community of sympathisers among the parents of the kids and the adults who train themselves. All these things on the whole strengthen the communist movement in our region.